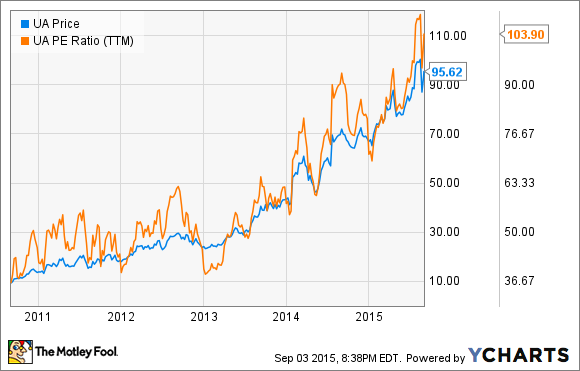 Is Under Armour Stock Too Expensive Near $100? Under Armour's stock has surged over the past two years and recently hit $100, before settling back below that mark. Have you missed your chance to get in on gains? Those savvy enough to have purchased shares of Under Armour (NYSE:UAA) four years ago have been rewarded with sixfold growth. But now that the stock has risen so much, up to a record high of $100 in August, have investors missed out on the chance to catch Under Armour's growth? I don't think so. Here's what Under Armour's valuation could like in a few years and why the current price might still be a good time to get in. As Under Armour's earnings have continued to impress Wall Street each quarter, investors have pushed the stock price up faster than those earnings have grown. Now at more than 103 times trailing earnings as of Sept. 1, it's far pricier than competitor Nike at 30 times earnings. Sure, Nike is an older, more established company, but even other growth-oriented companies are much cheaper, such as Lululemon Athletica at 35 times earnings. Compared with the industry average P/E of just 18, Under Armour looks expensive. While I would rarely say it's a good idea to pay such a high premium for a stock, in Under Armour's case there are many reasons to believe the stock still has a lot of room to grow into this valuation and provide more long-term stock appreciation. Consider that by year-end 2016 earnings estimates, UA's current price would be just 66 times earnings. Of course, a P/E of 66 is still high, but if the company can continue growing revenue to the $10 billion milestone, by recent profit margins that would put the stock at a P/E of just 34 at this current price. Getting to that $10 billion mark, about triple current revenue, is a goal that Under Armour CEO Kevin Plank has set for the company and one that analysts at Sterne Agee thinks could come as soon as 2020. Again, even at $10 billion in revenue and consistent profit margins, a P/E of 34 five years from now isn't very cheap, but the longer-term potential of this company is that $10 billion is just a milestone on the way to even more growth in the future. Here's what could push the company to that level of sales and beyond. Under Armour has been sponsoring lesser-known athletes and benefiting from their rise to stardom, such as with Jordan Spieth and Steph Curry. Signing these athletes early on has helped Under Armour in multiple ways, including adding value to the brand image as the rising underdog and gaining huge brand awareness for a much lower price than it would cost to sponsor someone like Lebron James. It has also helped Under Armour to quickly increase sales in key individual sports segments such as golf and basketball. While it's not likely that UA will overtake Nike in basketball or golf sales anytime soon, it does look as if the company still has a lot to gain in these segments in the next few years. Plank said he believes basketball will become a $1 billion segment, and other analysts have predicted UA golf could be nearly half a billion dollars by 2017. As sales of these individual segments rises, as well as the many other niche segments Under Armour is going after, such as running, skiing, and ballet, total revenues will probably continue climbing steadily. Under Armour made about 10% of its 2014 revenue from outside the United States. While that nearly $300 million isn't going to be much help toward the $10 billion goal, consider that international revenues jumped 108% over 2013 and are expected to continue climbing rapidly. It's because international is such a small part of Under Armour's current sales that it's such an exciting opportunity for the company to expand. Nike receives about half of its annual sales from outside the U.S., but it started just like Under Armour, with nearly all of its sales coming domestically. Under Armour's international sales growth is one more way it can triple its sale in the coming years. Under Armour's Connected Fitness segment was mentioned seven times in the most recent quarterly earnings, but most of those mentions were to explain why costs in 2015 have been high following the company's investment in acquired fitness apps and digital investment. While Connected Fitness is a very small part of Under Armour's current financials, it seems to be one of the company's most exciting initiatives. Under Armour's acquisition of fitness apps, as well as its own Record app released early this year, have built a platform of over nearly 150 million users. Under Armour has only started to monetize this segment, and as it continues to develop this platform and turn it into a more revenue-generating segment, this could be a growth driver that sets it apart from competitors that are focused solely on apparel and sports equipment. Under Armour is not cheap, and it's hard to justify such high valuations on potential future earnings. Under Armour is therefore not a company to bet on for short-term gains, as those days of quick stock-price jumps are probably behind us. Still, the long term continues to look strong, and investors willing to look five, 10, or 20 years out might see Under Armour as the dominating force in this industry over the next few decades. If that's that case, article headlines 20 years from might well talk about those who were savvy enough to have purchased shares of Under Armour back in 2015.